Built in 1936 by the Palmer Scott yard in Fairhaven, Mass. 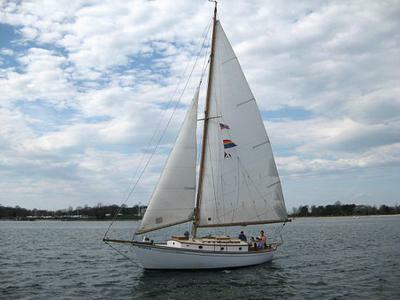 She is cutter rigged with a roller furling Yankee jib, staysail and main. She was built on spec by the Furnans Yacht Agency as a weekend cruising boat for average folks. LOD 27'4", LOE 35'10", LWL 23'8', Beam 9'8", Draft 4'9", 5.5 tons. Extra length from bowsprit and boomkin. Her hull is mahogany on oak frames with bronze screw fastenings. The keel is cast iron. The deck is cedar covered with fiberglass. I have owned her since 1994 and done most of the work myself with professional help when needed. Professional replacement of 30 hp Yanmar diesel. She sails out of Oyster Bay, Long Island North Shore. She's heavy and stable, never get the rail in the water, but moves along well in a good breeze. Good for you for taking such good care of her.